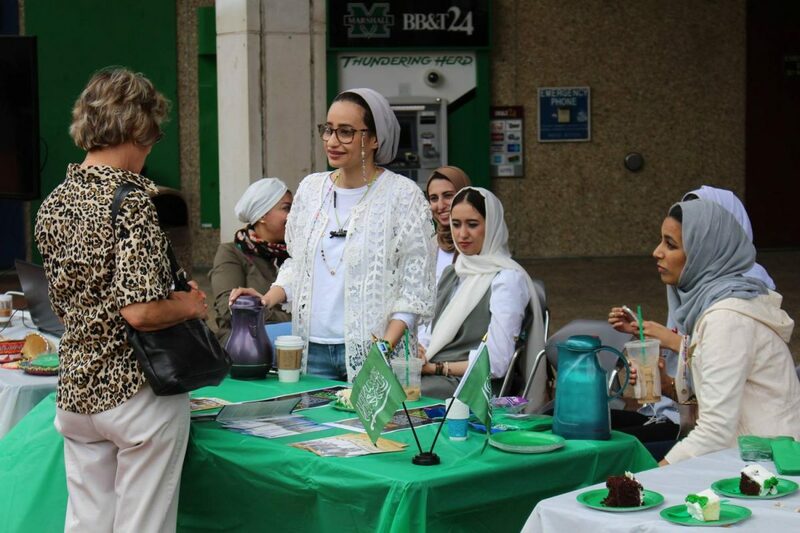 The Saudi Arabia Students Association celebrates Saudi Arabia National Day on the Memorial Student Center plaza Thursday, bringing cake, arabic coffee and cultural discussion to Marshall’s campus. Saudi Arabia National Day celebrates the founding of Saudi Arabia in 1932. This was the fifth year the Marshall organization has held the celebration. The celebration took place outside the Memorial Student Center, where the Saudi Arabian students featured traditional music, cake and informational pamphlets. National Saudi Day is celebrated each year on Sept. 23 in commemoration of the day the Kingdom was founded in 1932 by King Abdulaziz bin Abdulrahman bin Faisal Al Saud. Alhussain said this day allows everyone to unite as one people and to experience his culture. “This is a very important day because, before, Saudi Arabia was divided due to political issues and our independence,” he said. Bader Alharbi, a Saudi Arabian student and member, said foreigners tend to assimilate and remove themselves from their cultures when they arrive to the United States. “This day is very special to me because being in the United States, you don’t often see my people wearing our traditional clothes and costume,” Alharbi said. The Saudi Arabia Students Association will participate in the Homecoming Unity Walk, as well as the International Festival.